Can I use the JD7 with bass guitar or keyboards? Yes. The JD7 is a full range device. Although originally designed for electric guitar, it is perfectly well suited for any instrument. I heard most buffers sound bad. Is this true? It probably is more accurate to say that guitarists do not like the sound of most buffers as they tend to color the sound of the guitar due to the impedance being incorrect and of course the use of lesser quality circuit design. Class-A buffers are preferred by audiophiles as they introduce the least coloration. The JD7 employs 100% discrete components and class-A circuitry throughout to deliver the most natural tone. Class-A circuits are a tube-like circuit whereby a single amplification stage boosts both the positive and negative cycle of the wave. Class AB circuits break the wave into positive and negative components before they are amplified and then these are brought together afterwards. Class AB circuits are more efficient, quieter, and can generate more gain, but they do not sound as good. Today, most electronic amplifiers employ integrated circuits that combine many parts into a single chip. Although more advanced, most audio engineers feel that the sound of chip or opamp based devices do not sound as good as full-size individual components. Circuits that use full-sized parts are call discrete. What is Drag Control all about? When an electric guitar is connected to an amplifier, a circuit is created. The electromagnetic device we call a pickup completes the path. When a buffer (unity gain amplifier) is put in between, the relationship between the pickup and the amp is lost. It ‘feels’ different. Drag control reintroduces the relationship by loading the pickup as if connected to a tube amp. Why don’t other devices use load correction? 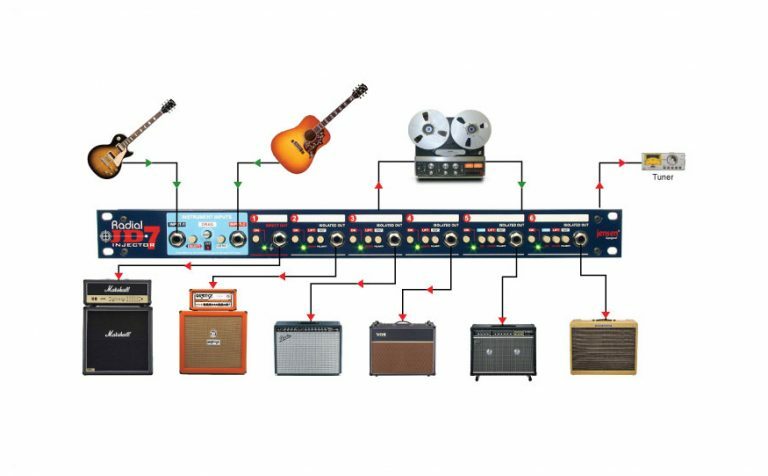 Most audio circuits are designed by technicians, not guitarists. Technicians tend to focus on the technical performance of the circuit while guitarists are very aware of the feel. At Radial, a product must not only perform well, it must feel right. 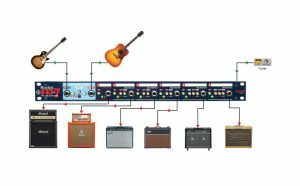 Will Drag Control work on active pickups like EMGs? Drag control is designed for passive pickups so any effect on active circuits will be very minimal. What is the big deal about Jensen® transformer isolation? Transformer isolation eliminates hum and buzz caused by ground loops. Dean Jensen pioneered the use of high performance audio transformers and from his leadership, transformer quality has excelled ever since. Can you explain the difference between phase and polarity? 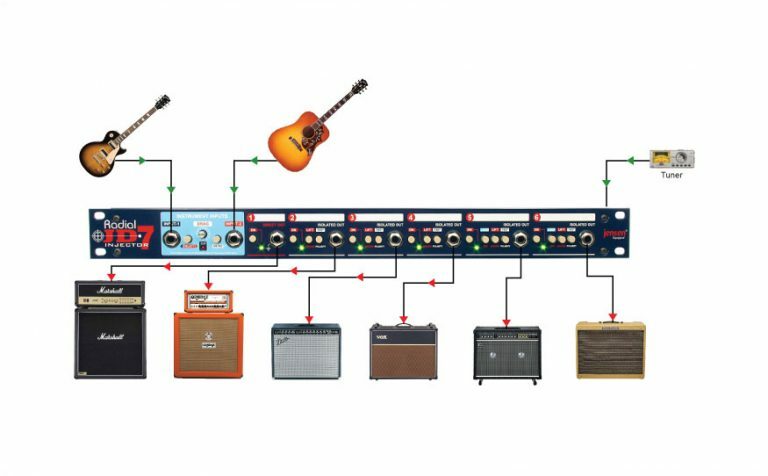 When a guitar signal is ‘out of phase’, what folks really mean is that something is wired backwards. In other words, the positive and the negative wires need to be reversed. This in fact means that the polarity is reversed. We use the term out of phase, but phase is actually in the time domain while polarity is in the electrical domain. Why do I need to use output-1? The JD7 employs an external floating power supply to help eliminate buzz and hum cause by ground loops. This of course disconnects all grounding to the JD7. The safety ground in between the guitar, JD7 and the amp is made via the channel-1 input. Why do you use a wall wart with the JD7? There are several reasons we chose to use an external power supply: High impedance guitar circuits are particularly sensitive to noise. By taking the power supply out of the metal frame, there is much less chance for noise to be induced. Also, because Radial products are shipped around the world, we can provide a different power supply for each country to meet their electrical safety requirements. Finally, because power supplies tend to be the biggest point of failure in electronic circuits, field replacement is easy. How would you compare the JD7’s direct box output to other Radial DIs? The JD7 employs a hybrid approach whereby an active class-A buffer feeds a Radial custom wound DI box transformer. This produces a balanced low-Z output designed to feed a mic preamp or mixing console. How does the JD7 compare to the JX44™? The JD7 is primarily designed for studio while the JX44 has all of the added switches and buffering stages for remote controlling the device in a live environment. The JD7’s simplicity and Jensen transformers will yield the best audio signal path (less parts), while the JX44 provides greater flexibility for concert level touring rigs. 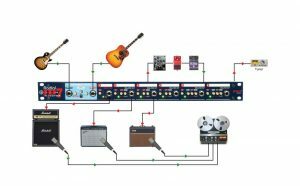 Can I use the Radial JD7 in a live touring rig? Yes. It is on stage with artists including Aerosmith, AC/DC, Cheap Trick and many others. The advantage is transformer isolation. The JD7 basically gets rid of problem noise making it easier for the tech to set up the guitar rig each night. Is the low-Z direct box output on the JD7 the same as a Radial JDI™? Yes and no. Yes, it employs the same Jensen direct box transformer, but unlike the JDI, the JD7 buffers the signal first so that it can split it to all of the outputs at the same time. Is the Reamp input on the JD7 the same as the X-Amp™? Yes. The JD7 employs the same 100% discrete class-A buffering circuit as the X-Amp.